Neil Young will release his new album Fork in the Road on April 7. The songs on the album are Young's response to the social and ecological questions facing the world's population. Ever the busy man, Young will also release the long awaited 10 DVD box set Archives Vol. 1 on June 2 which he produced himself. The project covers the period from his earliest recordings with The Squires in Winnipeg, 1963, through the classic 1972 Harvest record and more. You can pre-order the box set and find out more info by clicking the image. 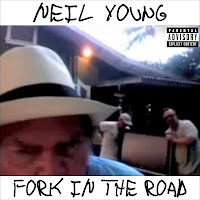 Young has also released a series of videos to support his upcoming Fork in the Road record. Check them out below.